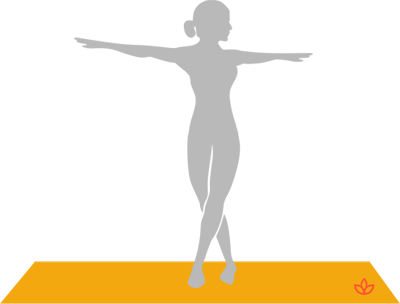 What is Standing Spinal Twist Pose B? Standing spinal twist pose B is a gentle beginner's twist that challenges balance. With one foot crossed over the other, the practitioner opens their arms wide and twists to the side. Though simple, the pose gently stretches the spine while developing focus. Stand with the feet together. Cross the left leg over the right leg. Place the foot outside of the right foot. Inhale and open the arms to a T shape. Exhale and rotate the torso and arms to the left. Breathe while holding the pose. Avoid this pose during pregnancy and if there is hernia or spinal injury.